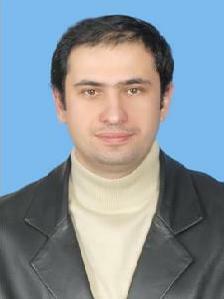 Mektiev Ali Javanshirovich is a PhD in technical sciences, the Head of the “Technology of Communication systems” Department of Karaganda State Technical University. He was born on February 4th, 1972 in Ossiniki, a city of Kemerovskaya region. In 1992 after graduating from Tashtagol mining college he worked in Karaganda foundry factory as an engineer for an energy service company. In 1999 he graduated from KarSTU and was qualified as an electromechanical engineer. On November 26, 2009 he defended his candidate thesis on the specialty 05.05.06 “Mining machines”. From 1992 to 2002 he worked as a teacher in the “Energy Supply and Electric power engineering” Department. In 2002, Mektiev A.J. was appointed as a senior lecturer of the same department. In September, 2010 he was appointed as the head of the “Technology of Communication System Department” where he made an essential contribution to the training of young experts. He is a scientific supervisor of graduate students in the “Electric Power Engineering” specialty. He was invited to the Ministry of Education and Science of the R.K. as an expert. The results of his scientific work are reflected in 26 scientific articles, monographs, 4 innovative patents of the R.K., and in 29 reports on National and International Conferences. He contributed 27 acts of innovation and application in Kazakhstani plants and factories. In 2016 he was appointed as the head of the “Energy systems” chair. He took park in the preparation of 34 methodic reference – books for practical, laboratory work and students’ individual work under teachers’ supervision 6 of the where text books, 24 of them were syllabi on such disciplines as electric power engineering, heat power engineering, radio engineering, electronics and telecommunications in Kazakh and Russian languages. He is an author of 5 video-lectures and 19 electronic books. Mekhtiev A.D. takes an active part in making agreements on adjustment of mine lifts, and adjustment of fixed equipment. Nowadays, he is involved with the output of increasing durability methods and reliability of constructive parts of electromechanical equipment by strengthening them in dangerous zones. He supervises the development and innovation of scientific technologies in the mining industry, he has prepared a set of documents on brake shaft machines for deep mines. He takes part in the research and investigation of energy supply programms. He works on the implementation of a new vacuum electric device for house heating. He is constantly increasing his qualification, participates in internships and has received a certificate from Beeline Company, Tele-2 and in KarSTU.